From Ampersand Prize-winning author Erin Gough comes this ferociously funny romp through an elite private school, and a brilliant feminist hoax that could change – or ruin – everything. Harriet Price has the perfect life: she’s a prefect at Rosemead Grammar, she lives in a mansion, and her gorgeous girlfriend is a future prime minister. So when she decides to risk it all by helping bad-girl Will Everhart expose the school’s many ongoing issues, Harriet tells herself it’s because she too is seeking justice. And definitely not because she finds Will oddly fascinating. Will Everhart can’t stand posh people like Harriet, but even she has to admit Harriet's ideas are good – and they’ll keep Will from being expelled. That’s why she teams up with Harriet to create Amelia Westlake, a fake student who can take the credit for a series of provocative pranks at their school. But the further Will and Harriet’s hoax goes, the harder it is for the girls to remember they’re sworn enemies – and to keep Amelia Westlake’s true identity hidden. As tensions burn throughout the school, how far will they go to keep Amelia Westlake – and their feelings for each other – a secret? Perfect for fans of David Levithan and Becky Albertalli, this triumphant queer YA rom-com explores politics, privilege and power, and has a gloriously uplifting teen romance at its heart. A delightful, timely romantic comedy of two opposites attracting, connecting and fighting for justice together at a private girls' school. I fell in love with Amelia Westlake. The characters were so good, believable and believably flawed, witty and warm – and it was deliciously subversive, with such a relevant and timely sting in its tail. 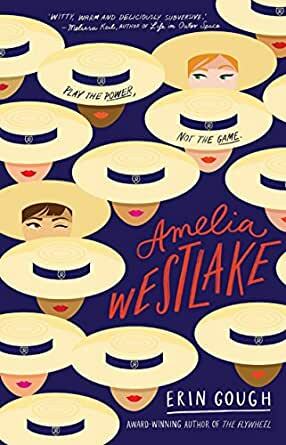 Funny, smart, romantic and uplifting, Amelia Westlake will steal your heart, together with Will Everhart and Harriet Price, the mischievous social justice warriors who gave her life. Together, they hatch a plan to challenge injustice and shine a light on hypocrisy and privilege, wreaking a fair amount of mischief along the way. You’ll fall in love with all three of them, like I did. Erin Gough brings us a story where misfit crusading Wil forms an unlikely alliance with Uber-princess Harriet to create the fictional Amelia Westlake at their very posh girls’ school. “Amelia” is responsible for several pranks that highlight the school’s double standards and naturally, the school principal is on the warpath. Issues raised include the effects of divorce on a teenager, sleazy talk from a male teacher, whether a girl can bring a girlfriend to the formal, and where loyalty lies between friends. Wil and Harriet have to learn some hard lessons. Alternate chapters are narrated in first person by Wil and Harriet with witty, fizzing energy. It’s hard to put down so give in and gobble it up in one go. BTW, although it’s classed as a YA book, it makes great reading for all adults. Amelia Westlake by Erin. I galloped through this story with two POVs, Harriet, the posh girl, and Will, the activist. They have nothing in common in the beginning of the story except going to a posh school. Harriet has visions of winning the tennis Tawney shield with her girlfriend. She's a prefect in year twelve and doing well with her studies. Will is an artist and also a lesbian who is the antithesis of Harriet but somehow Harriet is convinced they need to expose their past-Olympian coach, Hadley. They create Amelia Westlake but there is a concerted push from principal Croon and their editorial friend, Nat, to find out who she really is. The year 12 formal is surprisingly simple to pull off because Croon won't allow any of them to be partnered by their girlfriends. A satisfying ending.